Tag line: "The amazing story of the fourteenth Dalai Lama"
Kundun is a beautiful motion picture that, despite its impressive imagery, is a case study in emotion over style. This is not to imply there’s an absence of style. 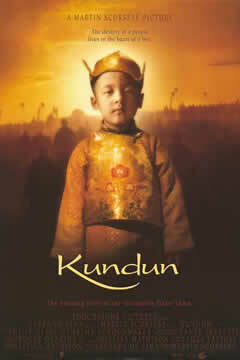 On the contrary: Scorsese’s prowess as a visual filmmaker is as alive in Kundun as in any of his movies. But due to the obvious reverence with which he approaches this film's subject, the 14th Dalai Lama, the great director never permits his patented cinematic flair to overshadow his main character. Based on actual incidents, Kundun relates the early life and struggles of the 14th Dalai Lama, a Tibetan religious leader who’s lived in exile since 1959, when an uprising in his country resulted in direct conflict with China. Believed the reincarnation of the previous Dalai Lama, he was “discovered” at the age of two, then, through the remainder of his childhood, was groomed for the high position. Aided by his trusted adviser, Reting (Sonom Phuntsok), the 14th Dalai Lama grows to manhood (played as an adult by Tenzin Thuthob Tsarong), at which point he must deal with the greatest threat facing his country: the Chinese occupation. Taking an active role, he attempts to meet with China’s Chairman, Mao Zedong (Robert Lin), to prevent further bloodshed. But when the Chinese plot to assassinate him, the 14th Dalai Lama has no choice but to leave his beloved Tibet behind and establish a government in exile in India. Faces are important in Kundun. At several points throughout the film, the camera focuses on the face of the young Dalai Lama, a life of responsibility thrust upon him at an early age. We also get to know, quite intimately, the faces of those around him, who realize, before he himself does, that, if the Dalai Lama is to lead his people, he will have to do so abroad, hundreds of miles from the place of his birth. There is pain in these faces, the pain of dealing with a changing world, and Scorsese makes sure we feel every bit of it. Shot primarily in Morocco, Kundun is stunning, with its gifted director making full use of the striking landscapes at his disposal. His camera, too, is always moving, free of constraints and gliding in a manner we’ve come to expect in a Martin Scorsese picture. Yet the visuals serve the movie. They do not divert from the film’s ultimate goal, which is to tell one man's story as best it can. The cinematic panache of a Scorsese work is there for the taking in Kundun; it’s just that the spotlight is never cast upon it.